At Market and Powell Streets is a turn-around to go back down the hill to Fisherman's Wharf. At the intersection of Powell and Market Streets is a ticket booth for the cable car and Muni. The San Francisco Cable Car is still a "San Francisco Treat" to ride and an excellent way to experience the City of San Francisco. 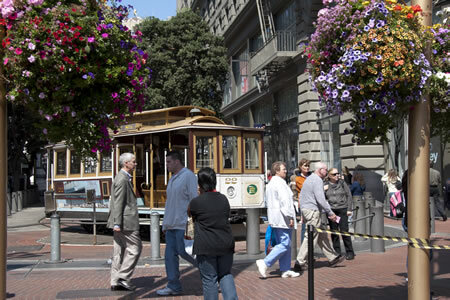 At the intersection of Powell and Market Streets in Union Square you will find the a booth for ticket sales for the Cable Car as well as some other types of products such as parking and weekly, monthly tickets. You can hop on board the cable car and head down to Fisherman's Wharf where you can visit Ghiradelli Square or enjoy an Irish Coffee at the Buena Vista. Street Car, Cable Car, what's the difference? Fares for the Cable car are: Adult & Youth (ages 5-17) $6.00 each way. $3 for seniors or those with disabilities. An All-Day Passport is sold for $14 by the conductors on the cable cars. You may want to purchase this if you will be riding more than one cable car vehicle, e.g., transferring between a Powell line and the California Line, as well as riding other Muni vehicles. 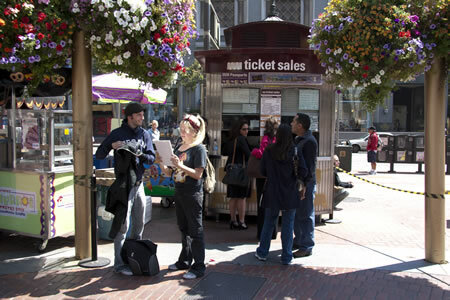 Single ride cable car tickets are available at ticket booths located at Powell and Market or Hyde and Beach. They are also available at the San Francisco Convention & Visitors Bureau at 900 Market St. in Hallidie Plaza, at Powell and Market streets. Located at 1201 Mason Street at Washington Street in San Francisco - and, YES, you can get to the Cable Car Museum from the Union Square Cable Car Turn-Around and along the line at intersections on Powell Street. You will find great information at the Cable Car Museum's web site, such as the history of the cable car, how cable cars work, bell ringing contests, how they rebuilt the system and information about the cable cars themselves.